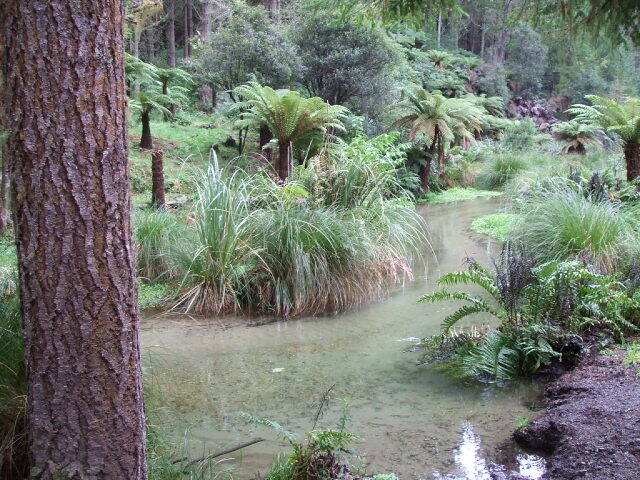 This is a little known Rotorua walk that wends it's way through ponga trees beside a tinkling stream… definitely a great place to unwind. Why mention it? Because it's a gorgeous little walk (30-40mins) and I would hate for you to miss out on it. This area is a nice spot to eat lunch or for contemplation. It's on the opposite side of the road to the walk. I take visiting friends out to this track and they love it, absolutely love it. 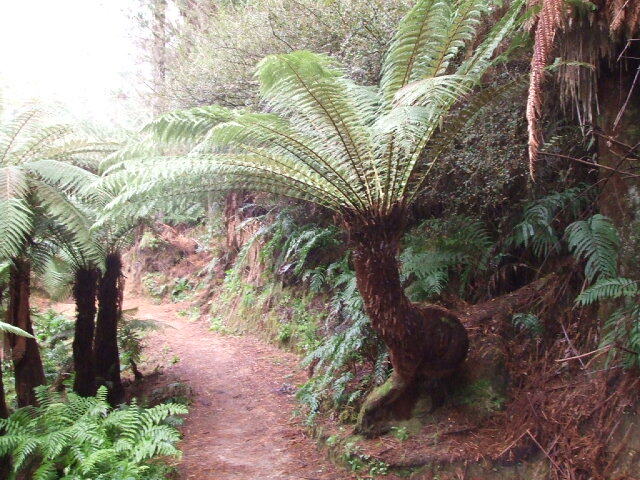 Parts of the walk are through a forest of Ponga trees that have all sorts of odd ways of growing. Some are buckled and bent like wizened old men while others have fused together to create spectacular shapes. Then another will appear dead with a tiny sign of life growing out the top. Wonderful. From the carpark (getting there is mentioned below) go through the forestry road gate onto Hill Rd. A large mountain biking map is situated about 20m along the road on the corner of Hill and Larch Rd. Turn onto Larch Rd and you are practically falling over the track. You will see a little stream that runs under the road. On the right is a lovely area with a few bench seats made out of fallen timber. On the left is the beginning of the track with steps going down. The water rushes out from under the road at this point which is very pretty. From here just follow the track as it winds its' way alongside the stream. More seating is set every so often if you want to sit and enjoy. The track branches sometimes but it meets up again. The track can end once you pass a big concrete reservoir and see the Waipa Sawmill on your right. From here you can either walk back to your car along the road to the left or return along the opposite side of the stream. The walk has been extended in recent times. 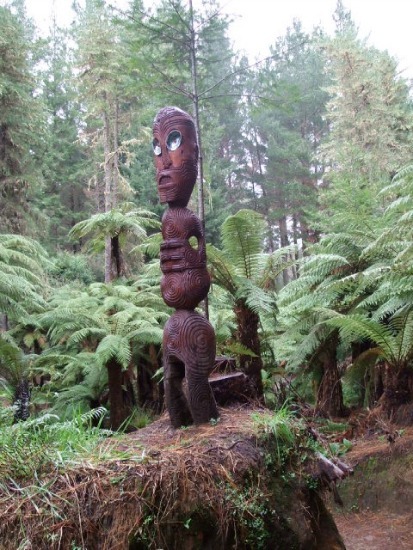 The Ponga Track is found on the Waipa Mill side of the city, where the mountain bike tracks are. If you head south from the Rotorua city center on Fenton St you will go past Te Puia on the left (can't miss it… big white concrete wall) and come to a gradual rise in the road. Turn in here and the main Rotorua mountain biking carpark is on your left about 100m (328ft) in. If you zoom in on the google directions map below you will see a 'P'. Continue along the road until you see a barrier arm. Turn right just before this onto the bypass road and continue - past Planet Bike (big signs) on the left - past a sawmill on the left until you strike a large curving corner to the right. Drive off onto the gravel before you actually go around the corner. View a larger picture of the map and zoom in. I have put little little flags to show Hill Rd, Larch Rd and the ponga track entry and where it comes out at the reservoir. You'll also notice a 'P' for parking. You will be parked on a hard right-hand corner either side of the road. Look for a forestry road gate (gravel road); that's Hill Rd which should be straight ahead. Walk around the gate to gain entry. I felt like a right twit, upside down with legs waving in the air. Thank goodness nobody came along while I was trying to extricate myself. Anyway, enough digressing, 15mins should get you to the forest from the city center and hopefully you enjoy it as much as we do. Let me know. It seems a bit weird to speak about food and toilets in the same breath. It shouldn't matter should it? Sorry but it's going to be au naturale for toileting at the Ponga Track site. The closest toilets are back at the main Mountain Bike carpark. You can also read about refreshments on that same page. They have only recently had that up and running. 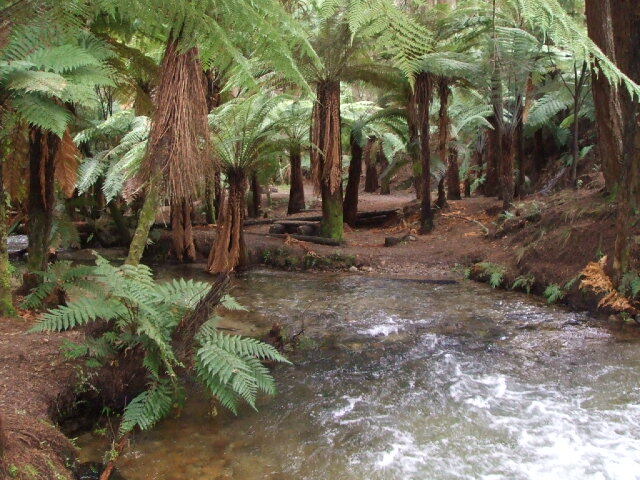 Use the Contact Me page if you have any questions about this particular Rotorua walk.